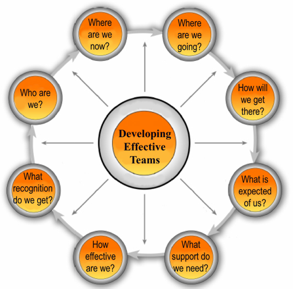 What is an effective team? And how do I create one? If you desire for your ministry to be effective, then those are 2 critical questions to ask. But what does it mean to be “effective”? For our purposes here, we’ll define effective as reaching a state where we are maximizing our potential, both as individuals and as a team. It implies that we are thriving, healthy, and strong – mentally, physically, emotionally, relationally, and spiritually. Do we clearly understand WHERE we are NOW? Do we know exactly WHERE we are GOING? Do we know HOW we will get there? Do we know WHAT is expected of us? Do we have all the SUPPORT we need? Do we MEASURE how EFFECTIVE we are? Do we CELEBRATE our accomplishments? If you need more of an explanation of any of the above questions, keep reading below. If you answered “no”, or “not sure” to any of the above questions, that is likely where you need to focus more time and energy in order to improve the effectiveness of your team. Any of those questions that you can not answer a firm ‘yes’ to are potential areas of weakness and can create mistrust, misunderstandings, and frustration on a team. WHO ARE WE? How well do my team members and I know and appreciate the unique personalities, giftings, passions, life testimonies, strengths, work preferences, and risk orientation of one another? And how well do those things match up with our ministry focus, goals, roles, and approach? WHERE ARE WE NOW? What is the current situation we find ourselves in? What do we know about our target audience? What are their needs? What challenges are they and we currently facing? WHERE ARE WE GOING? What is our ministry vision, mission and purpose? What are we trying to accomplish? HOW WILL WE GET THERE? What are our short and long range goals? What are our objectives and what plans have we made to accomplish them? WHAT IS EXPECTED OF US? What are the roles and responsibilities of each team member? Are they clear? Are they well suited to each person’s skills and interests? What processes do we need to define? WHAT SUPPORT DO WE NEED? What prayer, resources, finances, training, mentoring or coaching does our team and staff need? HOW EFFECTIVE ARE WE? How often do we evaluate our effectiveness as individuals and as a team? What can we learn from that? WHAT RECOGNITION DO WE GET? How well and how often do we celebrate accomplishments and successes, both as individuals and as a team? Ask your team the questions above every year as part of an annual team retreat where you prayerfully reflect on the past year, evaluate your teamwork, celebrate successes, consider lessons learned and set goals and plans for the year ahead. Identify in which of the areas above your team is functioning well, and in what areas it needs to improve. Set a goal or goals and identify action items that will help you improve in those areas. Follow-up. Once each month during a staff meeting, ask your team for feedback about how the team is doing at improving in the areas you chose. Ask for ideas of how to continue to improve and decide what additional actions to take. Try these 4 steps above and your team is almost guaranteed to improve. Try it today! For more information on how to build an effective team, click here.